The statutory authority is seeking an explanation for a loan provided by the FAI’s CEO two years ago. 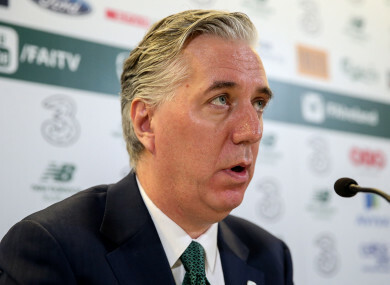 SPORT IRELAND SAYS it is seeking “urgent clarification” surrounding details of a €100,000 loan provided by John Delaney to the Football Association of Ireland (FAI) two years ago. The statutory authority released a statement on Tuesday evening stating that it had not received any notification regarding a reduction in the association’s financial position. “Sport Ireland has written to the President of the Football Association of Ireland seeking urgent clarification from the Board of the FAI on media reports concerning a loan to the organisation by its Chief Executive, including the circumstances of the loan and its repayment,” the statement read. On Saturday night, Delaney confirmed in a statement that he had provided a short-term loan to the FAI. “I am aware of stories circulating around this loan dating back to 2017,” he said. “I confirm that I made a once-off bridging loan to the Association to aid a very short-term cash ﬂow issue. A subsequent statement from the FAI tonight read: “The Football Association of Ireland has this evening received correspondence from Sport Ireland CEO John Treacy on behalf of Minister for Transport, Tourism and Sport Shane Ross. Email “Sport Ireland seeking 'urgent clarification' on John Delaney's €100,000 loan to the FAI”. Feedback on “Sport Ireland seeking 'urgent clarification' on John Delaney's €100,000 loan to the FAI”.